Yup! Team Blue for us woohoo! I can't believe I'm 20 weeks already, this pregnancy is whizzing by. The first trimester was taken up with the wedding then I found weeks 12-16 dragged; I was in a weird limbo but then time suddenly sped up and next thing we know we were sat at the Hospital ready for our 20 week scan. 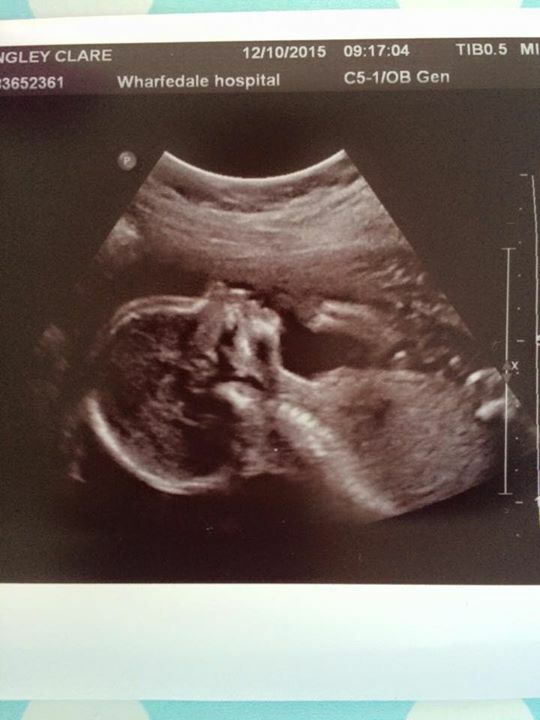 This scan was a bit different from the 12 week one as a student did it so it took longer then had to be checked to make sure she didn't miss anything. It did mean we got a double scan but it took ages - almost an hour in fact. The baby was being awkward too covering his face and had his legs crossed so getting the gender was hard but once the legs opened there was no mistaking it haha! We both felt a bit anxious at one point as the student didn't say much but once everything was double checked we were told all was fine and could breathe a sigh of relief. It's strange but I've had people asking me am I happy knowing it's a boy but why wouldn't I be? I grew up with 3 brothers and Mr T has 2 brothers and 2 nephews so we are both well used to lots of men in the family. Ideally I would love one of each but the main thing is to have a healthy baby at the end. We are both so lucky in that we didn't even actively try and boom, got pregnant instantly. So many couples try for so long and we both count our lucky stars that so far things have went really well for us. If you follow me on Instagram you will see that I have been doing weekly bump shots (bar week 17 when we were away). It's a nice momento and something I can show this little lad when he's older. Normal cake posting will resume on Friday, I've a very special cake to share with you all.